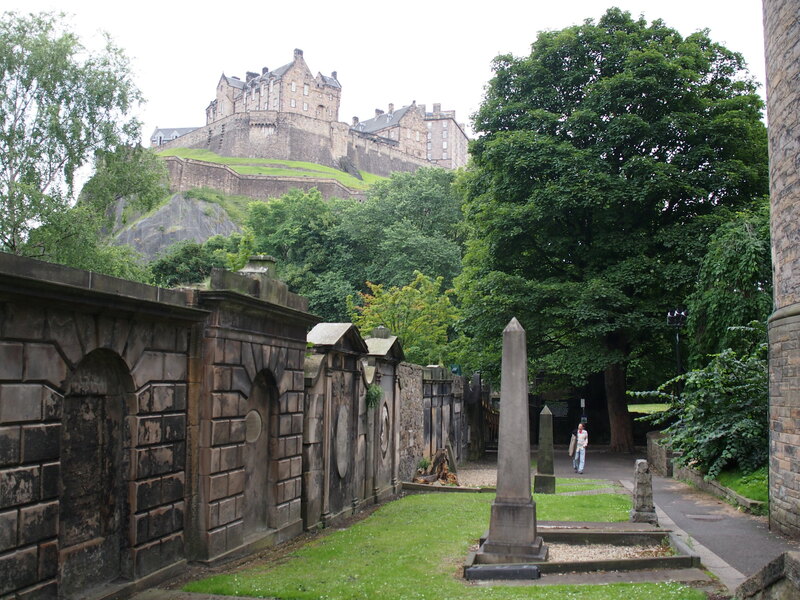 If you follow a flight of steps down from Edinburgh’s busy Princes Street you’ll find a church, largely hidden by trees and surrounded by an extensive burial ground. This is St Cuthbert’s Kirk, a site with a history going back many centuries. The kirkyard at St Cuthbert’s is home to some exceptional examples of funerary architecture, imposing memorials and beautifully-carved headstones that give the visitor an insight both into the way Edinburgh’s residents of the past viewed and commemorated death, and the exceptional skill of the people who designed and crafted the memorials. At the heart of Lancashire’s Ribble Valley, standing close to the banks of the River Ribble and overlooking Pendle Hill, is the church of All Hallows, Great Mitton. Within its walls is a remarkable collection of effigy graves, dating from the 16th to early 18th Centuries, all commemorating members of a local family whose fates were intertwined with some of the major political and religious upheavals of those centuries. Their elaborate graves also reflect the changing fashions both in clothing and in funerary architecture from the Tudor period through to the Stuart and early Georgian periods. Although the 19th Century is the most notorious period for desperate overcrowding in the churchyards and burial grounds of London, the problem of finding enough space to bury the city’s dead was not a new one. As London grew both in population and size during the 18th Century, little room was set aside for cemeteries and the garden we are visiting today is the first example of Anglican churches being forced to locate their burial grounds in far away from the churches themselves. Today, St George’s Gardens in Bloomsbury is very much a part of central London, but when the two burial grounds that were later landscaped into this pleasant park were first opened, they were surrounded by fields. There are so many fascinating old churches in London – however, St Leonard’s in Shoreditch is the first church where I’ve been greeted by a cat. Schrödinger, who was featured in an article on Spitalfields Life earlier this year, is a former stray who now lives at the church. The handsome black and white fellow seemed to spot me as soon as I arrived with my camera, and trotted into the church to wait for me to open the door to let him in. Not too far from where musician Jim Morrison is buried in Paris’ Père Lachaise cemetery stands an imposing monument that often gets overlooked by those set on finding Morrison’s memorial. It stands much taller than the graves around it, and on each corner winged skulls leer down at passers-by. It’s a superb monument, full of interesting details and rich imagery, and the man it commemorates lived a fascinating life. The heart of London is full of strange old places with unusual names and odd stories, but there is one place that for a very long time was not a true part of London at all. Ely Place, just to the north of Holborn Circus, was until relatively recently considered to be a part of Cambridgeshire. For centuries, it was an enclave – an area of land physically located in the City of London but not under its jurisdiction. Instead, it was privately owned by the Bishops of Ely, and even today the street has its own gatehouse and beadles. The beautiful landscape of the Isle of Mull is dotted with tiny burial grounds, each of them with their own stories to tell. We’ve already visited Pennygown, with its ruined chapel and graves ranging from the medieval period to the present day. Some of these cemeteries are close to settlements, others seemingly in the middle of nowhere. They are all in stunningly beautiful locations. The words and symbols preserved on the gravestones offer us a glimpse into the history of the island, and of the lives of the people who have lived and died there over the centuries.